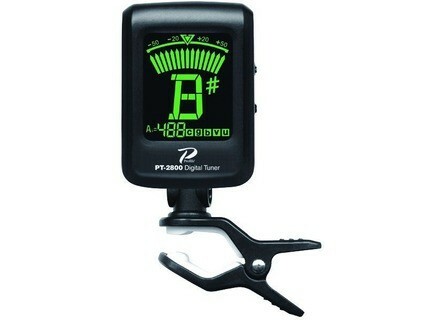 PT-2800, Tuner/Pitch Pipe/Tuning Fork from Profile. 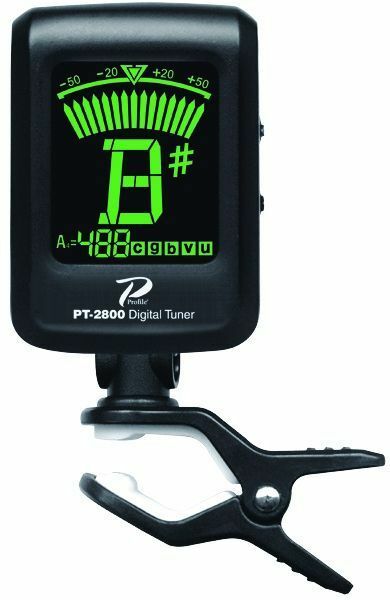 Profile has announced the expansion of its tuner/metronome line to include the new PT-2800 mini clip-on tuner. Now shipping and available, the PT-2800 features a bright, multi-colored LCD screen that according to the manufacturer is visible while attached to the instrument's headstock in any lighting situation. Screen color changes to green when correct tuning has been reached, allowing tuning at a glance. The PT-2800 is designed for use in loud environments like a rehearsal studio or stage. The tuner has separate settings for guitar, bass, violin, ukulele, and chromatic, and can be set for 430-450Hz operation. The PT-2800 can be attached to any stringed instrument and also tilts and swivels for easy viewing from any angle. Profile is distributed in the U.S. exclusively by American Music & Sound (AM&S). For more information, including pricing, visit www.americanmusicandsound.com. Gibson SG Zoot Suit Gibson Guitar and Steve Perry of the ska band Cherry Poppin' Daddies are making a "Zoot Suit music riot." FH(fx) Great Wall v2 Pedals FuzzHugger(fx) announced version two of their Great Wall fuzz pedal, now in a smaller enclosure. Taylor Limited 35th Anniversary Model 9-String Guitar As part of the company's 35th anniversary celebration, Taylor Guitars is readying the next set of what the company is calling "You Asked For It" models: guitars players have requested through the years that are first-of-a-kind for the company.